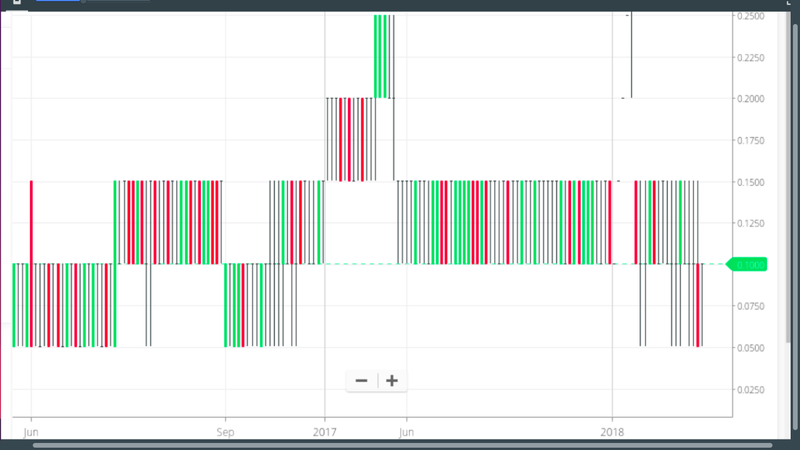 It would have been good if you included the timeframe and period for each candle in your question, however being a penny stock, what you are seeing is a candle chart when there is very little liquidity, as is a quality of most penny stocks. Each period or candle you might have only a few trades within a very small range,in fact in most periods there is only a one point range, one or some trades at the low and one or some trades at the high, and the open and close are also at the high and low. That is why you don't see any wicks or tails on the candle sticks. The variations in the stock price are very low compared to the quantification unit: The minimum change that the stock can undergo, e.g. $0.05 in your case. All order and trade prices have to be multiples of this value. This discrepancy is typical for pennystocks because in many cases the trading unit is not adapted when stocks go down. While a unit of $0.05 is adequate for a stock trading at $50, it is no longer suitable for a stock that is trading at $0.10. 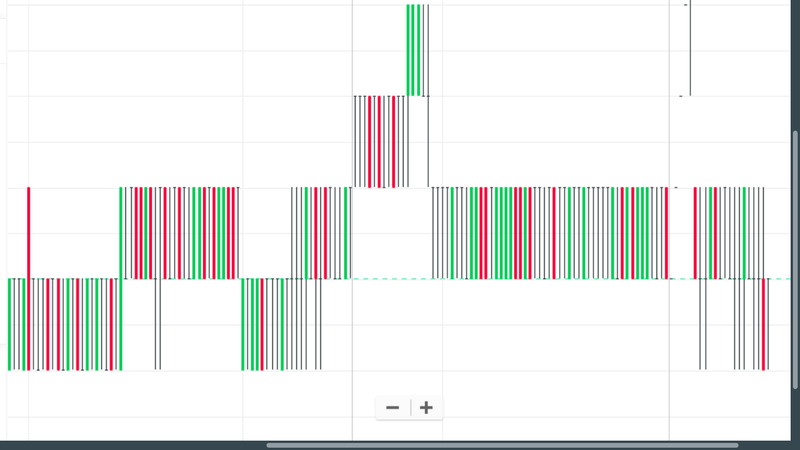 This makes you see that banded pattern in the graph, where the price jumps between two adjacent levels. A fair price might be $0.12, but since that value is not allowed, you see only trades at $0.10 and $0.15 during a long period of time (until the fair value has surpassed $0.15 or fallen under $0.10). Green candles (only body, no shadow) between adjacent levels, when the stock started at the lower value and ended up at the higher value. Red candles (only body, no shadow) between adjacent levels, when the stock started at the higher value and ended up at the lower value. Gray candles (only shadow, collapsed body) between adjacent levels, when the stock moved between the two adjacent values, but ended up at the same value as before. Since all those candles have the same length and position (reaching from one certain level to the next adjacent level), it makes the graph seem weird. You don't see the typical candle shape with a body and shadows above and below it because that would require at least 4 different price levels during that period, which never happens in this case. Not the answer you're looking for? Browse other questions tagged stocks stock-markets stock-analysis stock-exchanges stock-valuation or ask your own question. What does volume and huge daily price increases say about stock prices? Is there a candlestick pattern that guarantees any kind of future profit? Why is this stock price inflated by 70x its real price? On what time scales are stock support and resistance levels meaningful?